Conservative hard Brexiteers have released proposals which they believe could allow the UK to leave the EU's single market and customs union without the need for a hard border in Ireland. 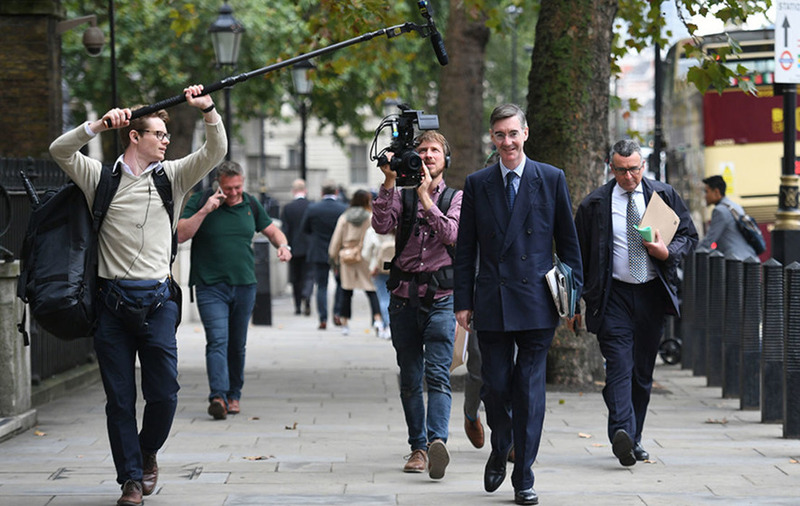 The European Research Group (ERG) of Tory backbenchers - led by Jacob Rees-Mogg - believe the British government has allowed the border question to become a roadblock to achieving a Canada-style Free Trade Agreement with the EU. "Since UK and EU standards are identical and will remain identical at the point of departure, determining equivalence after Brexit should be straightforward," said the document. Larger companies would use "trusted trader" schemes to clear their goods for export and import, and other declarations would be incorporated into the existing system used for VAT returns. The ERG paper said that Brussels had made "a major error" in listening almost solely to the warnings of Leo Varadkar's government in Dublin on the potential for the border issue to disrupt the peace process, contrasting his administration's stance with the "co-operative and practical" approach of predecessor Enda Kenny. They argued the Withdrawal Agreement proposals on the border are themselves a "clear breach" of the Good Friday Agreement, which requires decisions on the future of the border to remain a matter for the people of Northern Ireland. "The key obstacle in the negotiations is the EU's concern that goods could enter into the Single Market area through the Irish border without being compliant with EU standards or tariffs," said the ERG paper, launched in Westminster. "The question for the EU is whether this risk to the integrity of the Single Market is so serious that it could block a Free Trade Agreement with the UK." And it added: "In the debate over solutions to the Northern Ireland border issue, a proper sense of scale, perspective or proportionality has been lost. "The EU's objections are political not practical. The government has failed to set out what can be done to provide for customs compliance without physical checks or infrastructure on the Northern Ireland border." The document said that, under the ERG's proposals, "the EU will be able to maintain the integrity of its internal market without erecting a hard border along its border with Northern Ireland. "At the same time, the United Kingdom will be able to develop a fully independent trade policy rather than remaining a rule-taker." And it added: "This allows the United Kingdom to conduct an independent trade policy without threatening the integrity of the EU single market." In response to EU concerns that goods that do not meet its standards - like US genetically-modified crops and chlorine-washed chicken - might enter its markets via Northern Ireland, the ERG said that such breaches could be handled in the same way police on both sides of the border currently tackle smuggling of drugs, fuel or alcohol. "Law-enforcement agencies on both sides of the border co-operate to suppress smuggling without anyone suggesting that border posts and checks would make their efforts more effective," said the ERG. "If they can tackle trade in drugs, fuel, tobacco and alcohol without infrastructure at the border, they can prevent non-compliant goods from the UK reaching Irish retail outlets in the same way." "There is nothing which would reduce our commitment to the Belfast Agreement, or which might jeopardise peace in Northern Ireland," the group said. "Harnessing the latest developments in international best practice can deliver continued co-operation and prosperity in the best interests of the United Kingdom and the Republic of Ireland." The DUP said that the ERG proposals were "positive and timely". Deputy leader Nigel Dodds said: "The paper makes clear that, in the event of a free trade deal being negotiated with the EU, there are sensible practical measures which can ensure there will be no hard border between Northern Ireland and the Irish Republic. "It therefore accurately reflects the fact that the border issue is no impediment to the negotiation by the UK of a comprehensive trade deal with the EU. This a position we have consistently articulated. "For too long some have used the border issue, and the political process in Northern Ireland more generally, to try to mould Brexit to their way of thinking or to thwart it altogether. That should stop." At the launch, Jacob Rees-Mogg said he wants Prime Minister Theresa May to remain in place but to ditch her Chequers plan. Mr Rees-Mogg said the "policy needs to be changed" but he was "supporting" Ms May. Former Brexit Secretary David Davis said he thinks "we have got a very good" prime minister, but said disagrees with her on "one issue". Mr Rees-Mogg said Mrs May was "fantastically dutiful". He said: "I have long said, and repeated again and again, that the policy needs to be changed but I am supporting the person. "Theresa May has enormous virtues, she is a fantastically dutiful prime minister and she has my support. "I just want her to change one item of policy." Mr Davis said: "I have made very plain from when I resigned and thereafter that I think we have got a very good prime minister and, like Jacob, I disagree with her on one issue - this issue. "She should stay in place because we need stability and we need decent government as the backdrop to what we are doing in the coming six months." Asked if Theresa May would have to go if she did not drop the Chequers plan, former Brexit minister Steve Baker told the Press Association: "We are all very much trying to stay off that conversation. "The political situation is now quite grave bearing in mind who leads the opposition. "I think the grave threat to the security and prosperity in the UK is a Marxist Labour party in government. "So, we all need to just be cautious in what we do and what we say, and support Theresa May, invite her to change the policy, provide her with constructive ideas to do it and also encourage the European Union to think of our mutual interests and agree." He added: "We really aren't getting into the territory now of if she doesn't, because we don't want to be there. "I think everybody can look down the road and see that trouble lies ahead. We are trying to put off that trouble. We are trying to avoid political instability and difficulty and one of the ways we are trying to avoid it is engaging on the detail today."